The Moto X Style is in every way a successor to last year’s Moto X. It’s got all the requisite upgrades you’d expect: the better quad HD display, the better 21 megapixel rear camera with a front-facing selfie flash, and just an all around better look and feel. And somehow, it only costs $400. Picking up the Moto X Style Pure Edition (the unlocked version with Universal LTE support), the first thing you’ll notice is the size. Where Google’s Nexus 6, also made by Motorola, was a 6-inch monster that almost felt as wide as it was long, the 5.7-inch Style retains the same width of last year’s 5.2-inch Moto X, but just stretches the display to make the device noticeably longer. However, thanks to thin bezels on both the top and the size, the Moto X Style is easily the most hand-friendly “Big” phone I’ve ever held. It’s what the Nexus 6 should have been. 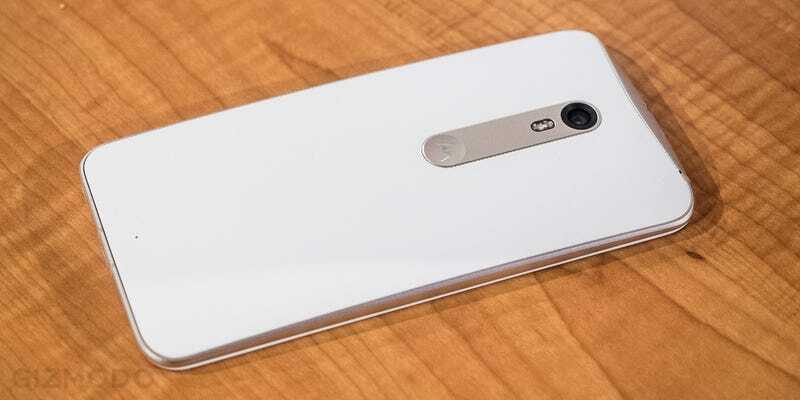 Like last year’s Moto X and the Nexus 6, the Style also has a sloping back that curves to the edges and like all Moto Xs before it, the smartphone is completely customizable with a variety of different colored and textured backs, as well as three aluminum frames—a champagne-ish gold, silver, and gunmetal grey. Once in the device, I powered up YouTube and watched a few hi-res videos. The viewing experience on the Moto Style is pretty stellar. The elongated display creates a more cinematic experience in landscape, and the dual-firing, front-facing speakers pushes all the sound right at you (instead of annoyingly in the wrong direction). As for Motorola’s software, it’s as good as ever, perhaps even better with an improved IR sensor that seemed to activate the Style’s Moto Display with less error rate than last year’s X. Also, with a Snapdragon 808 processor, there was no discernible lag at all during my brief hands-on. One strange difference is Motorola’s decision to go with an LCD display instead of a AMOLED one, which allowed the old X to not drain battery with that always-on Moto Display. Motorola is guaranteeing all-day battery life and says the new LCD panel and the new Snapdragon 808 processor can power those functions effectively without OLED displays, but we’ll have to see once we take a closer look. Motorola also puffed out its chest during the presentation saying how it’s improved the Moto X’s camera, now making it supposedly better than the new iPhone 6. Gizmodo’s camera expert Michael Hession took a few snaps side-by-side in low-light conditions, and while the Moto X Style had less grain than the iPhone 6, it’s impossible to say if it’s truly better than the iPhone 6. Resolution is only one aspect of a great camera, and we’ll need a little more time with it to make a definitive judgment. Now, let’s talk about that price. Starting at $400 (for 16GB and increasing $50 for each gigabyte jump), you’re getting some great stuff here. There’s also an expandable MicroSD card tray (up to 128GB) that actually shares the same tray as the SIM—it just rests on the other side. Granted, you are missing a few features. With Android M, Google is finally adding official support for fingerprint sensors, but the Moto X decided to ditch the feature to meet its crazy competitive price. The same goes for wireless charging. But Motorola thinks the style has plenty to entice people away from the wallet-busting alternatives and try something different—something that gives you the very best for the very least.